In stock -This product will ship today if ordered within the next 15 hours and 7 minutes. Take your time for this liberating herbal tea blend with dandelion leaves, fennel and lemon grass. The flavour is intense and spicy, with a sweet fennel yet also mild, fresh mint finish. 100% organic: spearmint, yarrow, dandelion leaves, fennel, lemongrass, marigold, caraway. Pour approximately 200ml of boiling water over a tea bag, steep for 2-3 minutes and the drink is ready for you to enjoy. 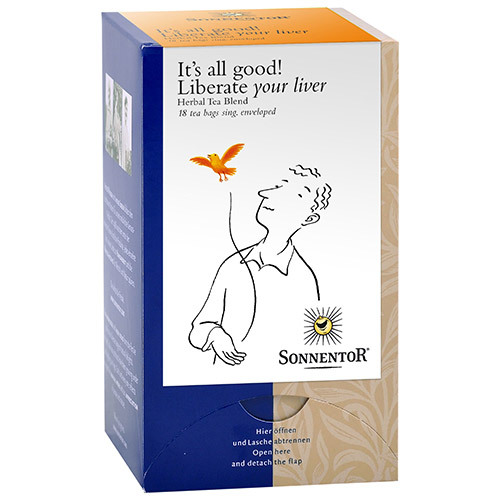 Below are reviews of Sonnentor Organic Liberate your Liver - 18 Teabags by bodykind customers. If you have tried this product we'd love to hear what you think so please leave a review. I like the taste, quality and ingredients. I would certainly buy again.